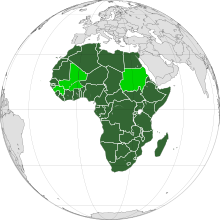 ^ African Union anthem, etc.. Africamasterweb.com. [26 November 2012]. （原始内容存档于2015-09-15）. ^ Report for Selected Countries and Subjects. International Monetary Fund. 14 September 2006 [26 November 2012]. ^ Report for Selected Country Groups and Subjects. IMF. 14 September 2006 [26 November 2012]. ^ Report for Selected Countries and Subjects. IMF. 14 September 2006 [26 November 2012]. ^ 非洲联盟（非盟）. 新华网. [2013-10-12]. （原始内容存档于2013-10-12）. ^ 新华网. 第28届非洲联盟峰会拉开帷幕. [30 January 2017]. ^ Dixon, Robyn. African Union suspends Central African Republic after coup. Los Angeles Times. 25 March 2013 [25 March 2013]. ^ Haiti – Diplomacy : Haiti becomes a member of the African Union – HaitiLibre.com, Haiti News, The haitian people's voice. Haitilibre.com. [26 November 2012].